At the SALT blog this week it was Ruth's turn to set the challenge and she choose inspiring Christian women - a great topic! They could be women from the Bible, from Christian history or from your life. 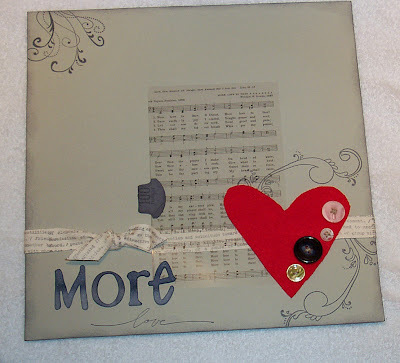 Ruth kept with a Mother's day theme and made a creation using the verses from Proverbs about a Woman of Noble character. Hop on over to SALT to check out Ruth's creation! I had a inspiring woman in mind immediately, Elizabeth Prentiss, who was the youngest daughter of one of the great revival preachers of the early 1800's, Edward Payson of Portland, ME. Elizabeth wrote the most amazing book, "Stepping Heavenward", which I have been priviledged to read a number of times. It's a wonderful book that deals with the trials of being a woman, a wife, and a mother and is written in a journal format. While it is fiction, the book is drawn from Elizabeth's actual experiences and has a profound affect upon women. If you can get your hands on a copy of the book, I highly recommend it! Elizabeth also wrote the hymn "More Love to Thee." She wrote to a friend in 1873, "To love Christ more - this is the deepest need, the constant cry of my soul. Down in the bowling alley, and out in the woods, and on my bed, and out driving, when I am happy and busy, and when I am sad and idle, the whisper keeps going up for more love, more love, more love!" Ah...for that to be my constant cry as well! -A tab was added to the hymn that says 100 percent...love that! I'm still on the fence on whether or not it is too plain...Boy do I struggle with keeping things simple. "I should add one more swirl...no, don't do it...oh, just a little something here, maybe another button...no, it's fine, leave it alone...well, how about some ribbon....no, that won't work...ok, maybe some more background stamping..." Such are my internal conversations down in my studio! LOL! I hope you enjoy and please take a stroll on over to the SALT blog to check out everyone's creations and to find out about our very first RAK! One of our dear team members, Casey from Scripture by Design , is offering a bunch of free goodies...Go check it out! Each of these women are amazingly talented and constantly inspire me with their creativity, imagination, and ability to get more work done in one day than any one person should! :-) Thank you!! 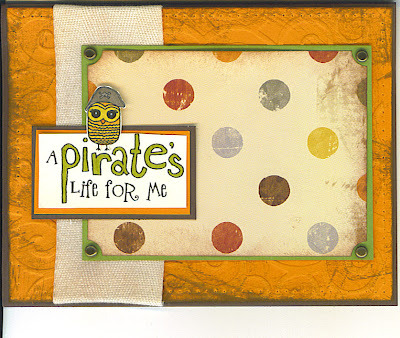 More pirate images from justjohanna! How cute is Al with his pirate bandanna? These are two separate images from Johanna; the boat and Al. And how about that? I pulled out some magic mesh! Anyone use this product anymore? I bought some years ago for a class and never touched it again but it just seemed to work with this card. That fun patterned paper? It's wrapping paper that Johanna wrapped some of my design team kit stamps with...isn't it so pretty? I loved it and put it away, knowing I'd be able to use it again some day. I'm happy that I was able to incorporate it into a card for her! Stay tuned...more fun justjohanna cards on the way!! Card is fairly simple...SU! 's basic brown served as a base for my card, layered with a swirly embossed, aged, and pierced piece of pumpkin pie cardstock (the swirls are like water, aren't they?). I don't recall the manufacturer for the polka dot paper but I love it - heck, I love polka dots! My fabulous sentiment (one of my favs that can be colored in!) 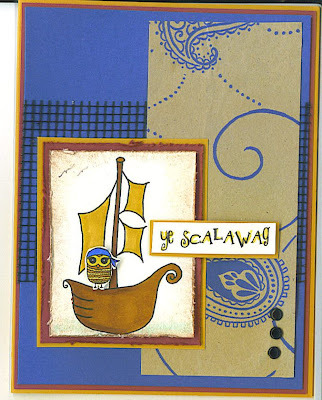 is layered on a few coordinating pieces of cardstock and Pirate Al is hanging out on top, declaring his desire to live life on the open sea, huntin' for buried treasure! Just a few stamps used for this card, both from justjohanna. 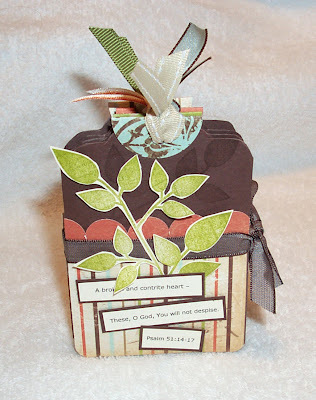 The chipboard heart has been covered with a red cardstock and stamped with a floral stamp that is created for use in corners but since the heart was small I was able to just use a portion of the stamp to cover the heart with the floral print. And then the so fabulous sentiment, "you have a certain je ne sais quoi." I love it! It's perfect for a Valentines Day card!! 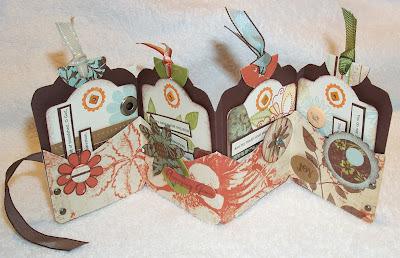 Patterned paper is an retired sheet from SU!, which I adore, wish I could get more, and other paper and ribbon is by SU! as well. 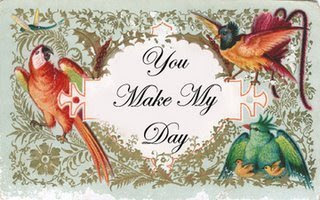 I created a card very similar to the one above for the hubby...Who on Wednesday said, when I reminded him about Valentines Day, "can't we just stare loveingly into each other's eyes and forgot about the cards and gifts?" hee hee (Translation: "I forgot to buy a card.") You have to know my husband and his sense of humor but he delivered the line perfectly and it gave me a case of the giggles for the rest of the day. 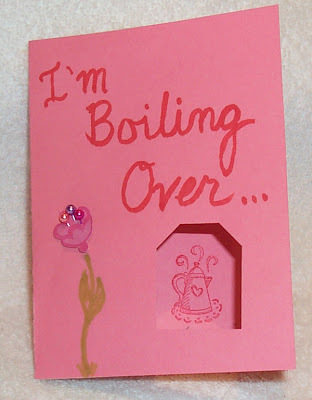 I, of course, had to make him feel a bit guilty by announcing that I had made him a special card. How cute is that?? The inside reads "...with love for you." He quickly used anything that was sitting on my craft table to make the card while I was in the shower. The coffee pot stamp is one I let the kids use, some - how creative is this - pearl head straight pins for the middle of the flower, and the flower was cut out of piece of scrap patterned paper that was sitting on my desk. The stem is hand drawn. This just made my night...too sweet! He's a hopeless romantic that husband of mine...LOL! These, O God, You will not despise." 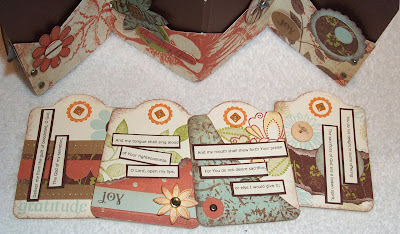 My creation consists of an accordion fold tag album with the verses above written on the four inside tags. The last line of the verse (a broken and contrite heart...) is on the cover of the album. I broke out one of my Papertreyink stamp sets, which I haven't inked in ages. I adore this set...it's versitle, the images are amazing, and I love the font and words. The paper is my favorite Crate collection, Crush. 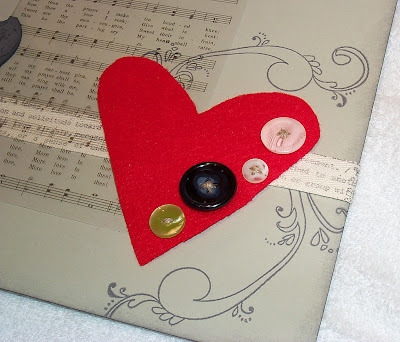 And all the embellishments, as well as the tags, are from Stampin' Up! blog and leave us a comment with a link back to your gallery or blog! I know, I know...you're thinking that you can't bear to think about the holidays again! I'm with you! 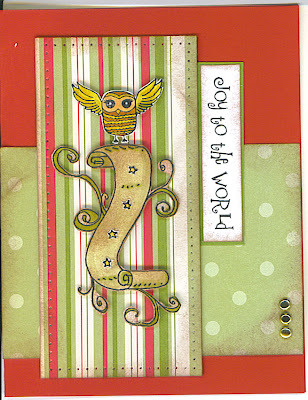 But I just had to share this card...one of the last cards created in 2007 using justjohanna images! This was another one of those "tricky" challenges where we could use the scroll image and any other justjohanna image to create a card. At the time I didn't have many jj stamps so it was indeed a challenge for me. My starting point was to simply stamp the scroll image and then sit at my studio table and stare at it...willing myself to come up with something brillant! LOL! That's about the whole story to my card making...just added some piercing, some aging (you all know I simply cannot live without aging), and some gold brads...oh yeah, and a handy dandy "Joy to the World!"